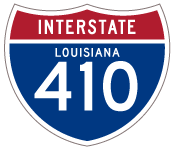 Interstate 410 was originally proposed along a freeway loop through West and East Baton Rouge Parishes. Branching northeast from I-10 near LeJeune, I-410 would have joined U.S. 190 and crossed the Mississippi River Bridge north of Port Allen to Scotlandville in Baton Rouge. Turning south along the Baton Rouge Expressway, I-410 would reconnect with I-10 at the east end of the Horace Wilkinson Bridge. The western leg of I-410 through West Baton Rouge Parish was subsequently dropped in the early 1960s. The initial stretch of the Baton Rouge Expressway linked East Boulevard in Downtown Baton Rouge with the State Capitol complex and Plank Road (LA 67) north by Memorial Stadium. With it no longer comprising part of a full loop, the urban freeway was renumbered as Interstate 110. Source: estimate from Google Earth. 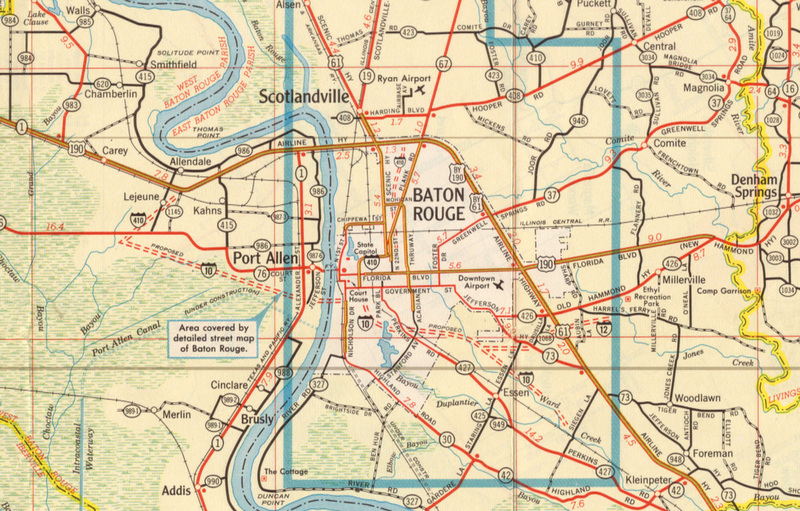 1961 Baton Rouge area map outlining the Interstate 410 urban loop. Three alignments were studied for I-410 near Luling and five in the Chalmette-Meraux study area. Various alternatives were also studied for the crossing over Harvey Canal (Intracoastal Waterway). The corridor ran within two to five miles south of U.S. 90 and Lapaclo Boulevard on the Westbank in Jefferson Parish.2 Within St. Charles Parish, I-410 was projected along an alignment approximately four miles west of Kenner. Further objection to Interstate 410 cited that highway was chiefly a land development corridor with little traffic demand and utilily as a bypass route for transcontinental travelers.2 Lack of coordination between highway planners, elected officials and the public ultimately led to the cancellation of I-410. The corridor for Interstate 410 resurfaced as part of the Louisiana Statewide Transportation Plan Update (December 2003) under project number LSTP-029.1 The project outlined an extension of Interstate 510 to the south and west from New Orleans East.6 However, it was never enacted upon. “Interstate 410, A Highway for Few.” from contributor Steven Delery in 2004. Interstate 410. 3 digit Interstates at kurumi.com. Thomas Lee Osborne, “The Interstate-410 Planning Process: A case study” (master’s thesis, Louisiana State University at New Orleans, 1972), vi. The Battle of New Orleans – Vieux Carre Riverfront Expressway (I-310) 27 June 2017.